Saturday, October 10th at 10:00 AM. 2. Prudently manage your portfolio. 3. Reduce risk by limiting behavioral errors. 4. Use actionable strategies for striking a balance between risk and reward. 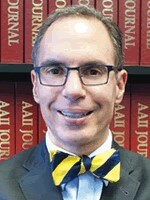 Charles Rotblut is a vice president at AAII. He is the editor of the AAII Journal, co-created AAII Dividend Investing, helps to manage the Stock Superstars Report portfolio and authors the weekly AAII Investor Update email. Rotblut is a Wall Street Journal expert panelist and a regular guest on MoneyLife with Chuck Jaffe. His book, “Better Good than Lucky: How Savvy Investors Create Fortune with the Risk-Reward Ratio,” was published in November 2010. Rotblut holds the Chartered Financial Analyst designation and has analyzed both publicly traded and privately held companies. He has worked for Zacks Investment Research, an investment research firm; INVESTools, an investment education company; Curian Capital, a money management firm; and McClure, Schumacher & Associates, a business valuation firm. Rotblut regularly speaks to the media, including The Wall Street Journal Radio Network, Canada’s Business News Network, and Reuters. He has also appeared on CNBC, Bloomberg Television, and Fox Business.